In a world of iPhones and connectivity to social media and email, we are all in constant connection with one another. Then why are so many people feeling burned out, distant from colleagues, and abandoned by family and friends? In this new book from the bestselling author of Running with the Mind of Meditation, the Sakyong uses the basic principles of the Shambhala tradition--meditation and a sincere belief in the inherent wisdom, compassion, and courage of all beings--to help readers to listen and speak more mindfully with loved ones, co-workers, strangers, and even ourselves. 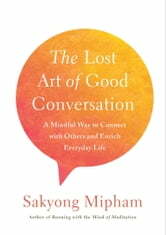 In this easy to understand and helpful book, Sakyong Mipham provides inspiring ideas and practical tips on how to be more present in your day-to-day life, helping us to communicate in ways that elevates the dignity of everyone involved. Great for families, employees and employers and everyone who spend too much time on Facebook, Instagram, and feel "disconnected" in our "connected" world, Good Conversation is a journey back to basics.